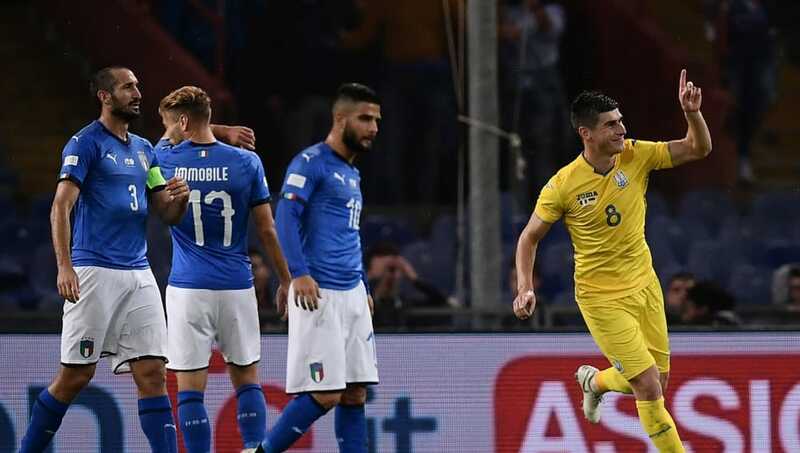 Italy stumbled to a 1-1 draw with Ukraine in Genoa, as the home side failed to build confidence ahead of their upcoming UEFA Nations League clash with Poland. After 55 minutes Pyatov undid all the good work he'd done in the first half. Federico Bernardeschi drifted inside onto his left foot and let fly with a speculative shot from 25 yards out, Pyatov appeared to have it covered - but the 'keeper could only palm the shot into his own goal. Ukraine would grab a shock equaliser just seven minutes later though, a deep corner was headed back to Ruslan Malinovsky and the midfielder expertly steered a left footed volley into the bottom corner from just inside the box. Ukraine weren't finished there though, as Malinovsky crashed a long range free kick against the underside of the bar just ten minutes later to further show the Italians that their counterparts had grown in confidence. In truth, Italy probably had enough chances to win the game, but Roberto Mancini will be worried that his side looked disjointed in the final third for a large part of the game. With Italy's pretty football mostly played in front of Ukraine, you couldn't begrudge the Eastern Europeans their 1-1 draw. Italy boss Roberto Mancini opted to start without a true number nine, despite having Ciro Immobile on the bench. Lorenzo Insigne started through the middle, and although he showed glimpses of quality, Italy lacked a focal point going forward. The introduction of Immobile meant Insigne would take up a position he's more comfortable with - left wing - and as a result Italy looked more threatening going forward. Starting XI: Donnarumma (6); Florenzi (6), Bonucci (6), Chiellini (6), Biraghi (6); Verratti (5), Jorginho (6), Barella (6); Bernardeschi (7), Insigne (7*), Chiesa (5). Substitutes: Immobile (6), Bonaventura (N/A), Pellegrini (N/A), Berardi (N/A), Piccini (N/A), Criscito (N/A). Despite starting out of position in a central role, Insigne was lively throughout the game, combining multiple times with Bernardeschi and Chiesa in between the lines. The Napoli man was the stand out in an Italian front three that really struggled to create clear cut chances, and when Immobile took to the pitch he combined well to get in behind an unforgiving Ukraine back line. Has there ever been a winger who possesses so few traits that a winger requires? No true pace, no trickery, no real crossing ability, Chiesa didn't have the best of nights. The Fiorentina man found himself in a couple of promising positions, but seemed to delay playing the final ball, or simply chose the wrong option. Not a good showing. On paper, Ukraine's side appeared to be set up as a more functional unit than an XI that was going to impose their style on Italy. But with Marlos on one wing and Yevhen Konoplyanka on the other, the Ukrainians had plenty of trickery to give a strong Italian defence some headaches. Both looked lively when on the ball, and against weaker sides could find some joy going forward. Starting XI: Pyatov (7); Karavaev (6), Burda (6), Rakitskiy (5), Matviyenko (6); Marlos (6), Zinchenko (6), Sydorchuk (6), Malinovsky (8*), Konoplyanka (7); Yaremchuk (5). Substitutes: Tsigankov (6), Stepanenko (6), Petriak (N/A), Kravets (N/A), Kryvtsov (N/A), Butko (N/A). The midfielder scored the all important equaliser for his country in an all round impressive display. His left foot appears to be a considerable weapon from set pieces and his range of passing was strong throughout the evening. Despite making a number of important saves in the first half, Pyatov's night will only be remembered for one thing. His positioning appeared to be good for Bernadeschi's speculative shot, but he simply wasn't strong enough when trying to palm the ball away, and the result was a rather embarrassing goal to concede. Italy face a trip to Poland for their next UEFA Nations League fixture, and Ukraine will play host to Czech Republic on Tuesday.